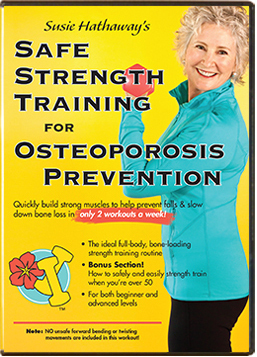 Here are 12 tips for adapting exercise programs if you’re over fifty or have osteoporosis or osteopenia, using the 12 exercises in the 7-minute workout as examples. 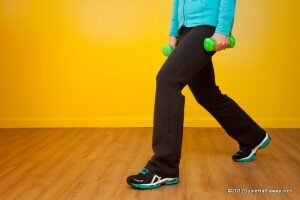 Number one, always check with your healthcare provider for guidance on any new exercise program. What works for your neighbor might not work for you. You might need individual adaptations, so it’s always best to go with personal guidance from your physical therapist, qualified trainer, or healthcare provider. Jumping Jacks can be hard on knee and hip joints and might be too much impact if you have very fragile bones, especially the bones of the spine. You can do Jumping Jacks by stepping to the side, instead of jumping, to lessen that impact. In my classes, we do a variety of leg and arm movements in the warm-up to get the whole body warm and ready for the strength training to come. 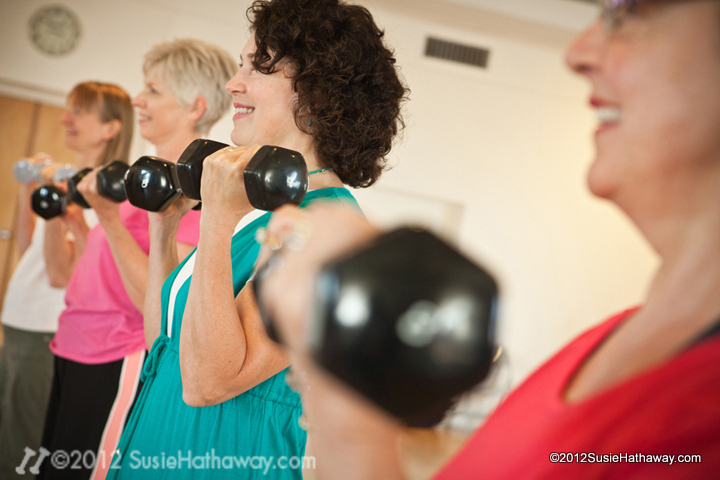 We start out with brisk walking in place, swinging our arms, then add variations. The Wall Sit is one of the more stable ways to squat, but it’s an isometric exercise and therefore is not recommended for individuals with hypertension or heart disease. See the Wall Slide in the National Osteoporosis Foundation’s (NOF) article where you keep moving, so it’s not an isometric exercise. Push-ups are an excellent full-body exercise, but it’s best to start on the knees instead of the toes or even a wall push-up. For many women over fifty, push-ups may not be doable at all because of low upper body strength, a high body mass index (BMI), or wrist problems. Crunches. 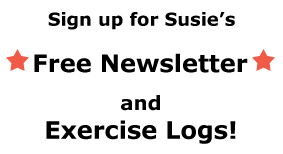 Read what Stuart McGill of McMaster’s University has to say about them. His short version is, “There are only so many bends in your spine until the discs eventually herniate.” There are better ways to strengthen your abs without stressing the front part of your vertebrae, the bones of the spine, or the intervertebral discs, the soft cushions between the vertebrae. With bone loss, keep your upper back on the floor for abdominal exercises. Planks are also very effective. See #8. The Step-up is an excellent exercise to strengthen the quadriceps. But starting by stepping onto a chair seat? That is way too hard on the knees and practically a prescription to strain a quad muscles or hurt a knee. If a client’s knee is ok with it, I’ll start her on a 4” step, and then go a few inches higher as is well tolerated, but never to chair height with the knee joint at a right angle. The Squat, as demonstrated in the NY Times article, goes too low with the hips, below the knees. The squat is one of the best exercises of all if it’s done correctly with knees behind the toes and not drifting inward, chest up and not collapsing down or rounding, and hinging back with the hips to keep a neutral spine with the pressure on the muscles, not the knees. That Triceps Dip can probably be done by most men, but for many women over fifty and those with shoulder issues, it’s probably too hard to support most of one’s entire body weight while doing those dips. It can also be hard on the wrists. Tricep extensions can be a better choice. Ah, the plank. It’s one of those good-for-many-people sorts of exercises. But, what I’ve found in teaching thousands of strength training classes is that the full plank is too hard if a woman is quite deconditioned, has low upper body strength, or has too high a body weight for her arm strength, to name a few reasons. Starting on the knees instead of the toes is helpful when learning the plank. High knees, running in place. In my experience, high knees, walking in place instead of running, gives enough intensity and a good heart workout. We do Lunges in class, but I remind everyone to “listen to their knees” and not go so low if they feel knee pain. Push-up with rotation. See #4. The rotation might work for those with a high level of fitness, but not with those with bone loss if the rotation is to the point of strain or rounds the back. There is also a risk of falling with this one. Side Plank. It’s an effective one, but my sports medicine physical therapist, who is an expert in shoulders and knees, doesn’t like it. She advises that it needs to be done very carefully and judiciously because she has seen that it can cause shoulder problems. A few people in my classes are able to do side planks, but most stick with and get good results with the regular plank on the hands or forearms. So, there you go. If you’re exercising and over fifty, especially with osteoporosis or low bone loss (osteopenia), adaptation is the name of the game. You might need to take more time between the exercises. Often, an exercise routine like the 7-Minute Workout sounds just perfect, but unless it keeps your spine in a neutral position when you have bone loss, it’s not. In general, avoid fast jerky movements, twisting to the point of strain, bending at the waist, or a precarious position that puts you at risk for a fall. 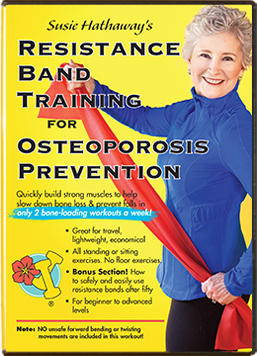 Some of those 12 exercises qualify as risky with bone loss, so this is a precautionary tale. Move, but move safely! If you have a particular way for adapting exercises to make them work for you, let us know! Thanks! ← 7-Minute Workout? Appropriate After Fifty? Thank you so much for your article, “12 Tips For Adapting the 7 minute Workout”. Thank you, Susie! I am doing your strength training exercise and have -2.5 in spine. Stopped to see if plank safe and found this — very helpful! You have no idea how important both your strength training and resistance bands workouts have been to me this year!! How nice to hear from you, Barbara! As long as you’re keeping your spine in a neutral position and not rounding forward at any point, the plank is a terrific full-body exercise.